All the latest buzz about the Helm! Hey Helm fans! If you like Jim Hardison's writing, you may want to check out a couple of new on-line comics he's got up at THE GUTTERS. They're written by Jim and illustrated by the very talented Salgood Sam. And if you don't like Jim's writing, then you might want to check them out anyway so that you can write nasty comments about them! The Helm on Digital Darkhorse! Hey Helm fans! I just got word from Dark Horse that they will be releasing a digital edition of The Helm on their digital.darkhorse.com site on 6/29/2011! They plan to offer the first issue free and charge $1.99 each for issues 2-4. There will also be a bundle of all four issues for $4.99. I'll put up a link to the digital version of the Helm as soon as it becomes available. Tribune Article About The Helm Speaks! The Portland Tribune just ran an article about The Helm Speaks which you can read by clicking this link. It's by reporter Peter Korn and it even features a picture of me, Jim Hardison! Whoot. The Helm Is Back In Print! I know you've all been breathlessly awaiting the second print run of the Helm, so it is with trembling lips that I tell you that the 2nd American edition of the Helm is in stores NOW! That's right! Only, since I typed the news, I suppose it was my fingers that were trembling rather than my lips. 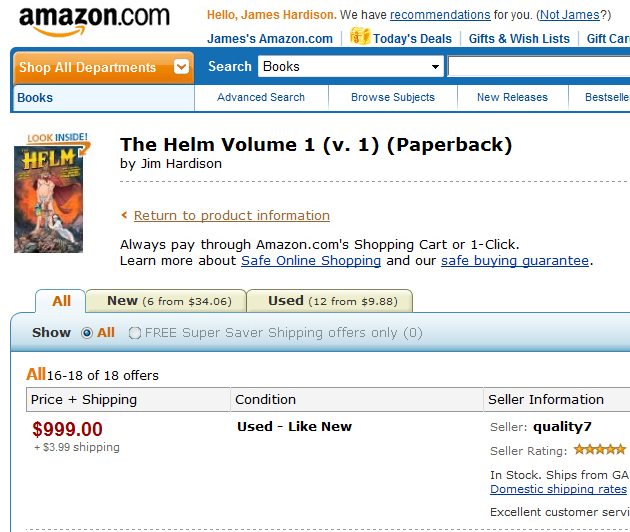 Anyway, you can now, once again, buy the Helm for it's regular cover price instead of $999.00 on Amazon. The Helm, Still Under A Thousand Dollars! New Edition of the Helm in February! My editor tells me that a second print run of the Helm should hit stores at the end of February! No specific date yet, but now there's a ballpark! And just in time, too. I've noticed copies of the first edition selling on Amazon for $80.00! Not in the bad way. I just mean that the first print run of the Helm has sold out and a second print run is in the works at Dark Horse! Stay tuned for the on-sale date! The Digital version of the Helm is currently #2 in the Top Ten Action/Adventure titles on the Panelfly app and is rated five out of five stars on the Comixology app! I'll be adding a new page to the Helm Website shortly! A French page in honor of the coming publication of the Helm in French. Keep your eyes peeled! That's right! Check out the Helm Store for new Helm themed t-shirts! As of today, June 18th, 2010, The Helm graphic novel is available as an iPhone app through Comixology and Panelfly. Free previews are available on both sites, so check it out! La Barre être publiée en français! That's right, the Helm is going to be published in French! I just got the go-ahead from the fine folks at Dark Horse to announce that the Helm is going to be published in French-language print and digital editions for France, Belgium, Switzerland and Canada by French publisher Bragelonne. I don't know the exact release date yet, but it should only be a couple of months before French speaking peoples are enjoying the Helm in French. Two Bits of Helm News in the Works! Of course, they're top secret at the moment, but expect an announcement in the next week or so. New Page! The Flaming Sword! That's right folks, there's a new page on the Helm site! It's called The Flaming Sword and it's where Mathew and the Helm review books, movies, TV shows, music, games and whatever else they see fit to praise or complain about. Ratings are based on a flaming-sword-system, with five flaming swords from each reviewer being the most awesome and no flaming swords being the crappiest. So check it out right here! The Public Library Association signing event was a smash hit! Thanks to all of the enthusiastic Librarians as well as to Thea and all the fine folks at Dark Horse. Upcoming Signing at Public Library Association convention March 25th! Holy Crap! Another opportunity to get your copy of The Helm autographed by writer Jim Hardison. The PLA show is in Portland at the Oregon Convention Center and Jim will be signing at the Dark Horse booth from 2:00 to 3:00 PM, Thursday, March 25th, 2010! YALSA names The Helm One of the Top Ten Great Graphic Novels for Teens of 2010! The American Library Association's Young Adult Library Services Association (YALSA) announced their 2010 Great Graphic Novels for Teens list today. The list, consisting of 73 titles chosen from 127 official nominations is presented annually and is made up of titles recommended for 12-18 year-olds and have been deemed both good literature and entertaining reading for teens. In addition to the full list, the committe also chose their Top Ten Great Graphic Novels for Teens, and guess what title made the top of the list? That's right, The Helm! Sure, the titles were listed alphabetically, but The Helm was still first! Whoo Hoo! Eva Volin, Chairperson of the committee said, "I and the committee agree that The Helm is both great and great for teens. Thank you for giving us such a wonderful book to read." Now, that's what I like to hear! The Helm Speaks Is Drawing to a Close! Yes, it's sad but true. One month from today, on February 15, 2010, the Helm Speaks feature will have been running for exactly one year, and a year's worth of advice from the Helm is about all the world can stand. Of course, we'll leave the timeless advice of the Helm on the site like a daily calendar of useful ideas-so feel free to check it out anytime. But, we're now counting down the last 30 pearls of wisdom. Starting on February 15, we'll be putting up a new feature. More on that in the days to come. And, there's some other news brewing which I cannot reveal at this time, so stay tuned! 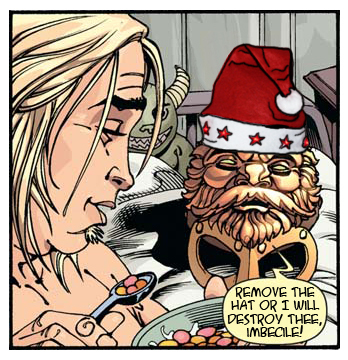 I'll be Helm for the Holidays! That's right, Christmas (and/or Hanukkah if that's your thing) is coming and it's time to start thinking about gifts for your loved ones. And guess what? The Helm graphic novel makes an excellent gift! It's true! So click on the image of the Helm in the Santa hat or visit the Store and get all of your holiday shopping taken care of early. Then you can relax, safe in the knowledge that you're shopping is done and everyone on your list will have a holly jolly, hilarious holiday season filled with the toasty warmth that only the murderous wrath of The Helm can bring. Okay, so technically, it's not a new review, but I just found it, so it feels new to me. ShelfAbuse.com says, "...The Helm made me laugh more than any book has in a long while...The titular Helm’s steady insults are utterly hilarious throughout." Jim will be talking with the folks at Where Monsters Dwell on CHSR 97.9FM wednesday July 1st at 6:00 PM PDT (or 10:00 PM ATL for those in Canada where the show is actually being broadcast)! Check out the show website by clicking Where Monsters Dwell and tune in to hear Jim's girlishly high pitched voice. That's right! Number 225 on the list! Whoo Hoooo! Thanks to all of you who bought a copy! Jim will actually be talking with the folks at Where Monsters Dwell on a different, as yet undetermined day! Apparently the station is having some difficulties. We'll keep you posted about the actual date as soon as it is scheduled. Sorry to all of you who eagerly cleared up your own schedules so that you could devote your undivided attention to THE HELM!! Jim will be talking with the folks at Where Monsters Dwell on 95.7 FM CKTP wednesday May 20th at 3:40 PM PDT (or 7:40 PM ATL for those in Canada where the show is actually being broadcast)! Tune in and hear his squeaky voice! Check out the show website by clicking Where Monsters Dwell. "For anyone with a less-than-heroic physique who’s dreamed of being a hero anyway, this is a simultaneous long, hard look in the mirror and a playful bit of wish-fulfillment..." That's right! They seem to like it! Check out the whole review by clicking AV Club. Jim will be doing a signing at the Stumptown Comics Fest on Saturday, April 18th from 4:00 to 5:00 PM at the Dark Horse Comics booth. Drop by and say hello! The American Library Association has nominated The Helm for addition to its Great Graphic Novels for Teens Booklist. But then, you probably already knew that because you read the headline. You can check out the rest of the Nominees right here. Darn! I just got an email from my editor, who just got an email from Diamond--the distributor. Apparently, March 25th is the ship date, not the on sale date! The on sale date will be April 1st. That's right, April fools day. Hmmmmmmm. Yes, that's right! I was just on the Dark Horse website and noticed that they've changed the date for the Helm TPB release from April 8th to March 25th!! AICN selected the cover of the Helm #1 in their annual @ssie Awards! "...the one cover that hooked me and reeled me was THE HELM. The premise of the series in one perfectly paired marriage of image and text..." Visit AICN to see all of the @ssie Award recipients! The new cover of the Helm TPB is now displayed on Amazon! Check it out! Buy many copies! The headline pretty much says it all, but you can check out the list yourself at the Re:Generator site. It's number 268 to be exact, but who's counting? I'm counting, that's who!! Just on time for the issue #4 release, Dante Maddox of Crave Online has reviewed the Helm series--and he seems to like it...a lot!! Jim will be doing a signing at the Dark Horse Comics booth at the Wordstock book festival on Saturday, November 8th in Portland, Oregon from 1:00-2:00PM! Be sure to drop by for an autograph! Harlan Ellison mentioned the Helm series in an interview with comics Website CBR. "Q: What comics do you read these days, if any? A: Well, I’ve just read a long run of Mike Carey’s CROSSING MIDNIGHT, eighteen issues in one sitting. Peter David’s FALLEN ANGEL is an ongoing pleasure. A new Dark Horse mini-series, THE HELM, is fun. CONAN. SIMON DARK. Anything written by Warren Ellis or Kyle Baker." Just got word that the new release date for issue number four is projected for the 19th of November. That's right, you can now pre-order the collected issues of the Helm in nifty book form on the amazon.com website. Check it out at Amazon where it is listed with a release date of April 15, 2009. Tax day? What the heck?! Yes, the Helm #3 actually did hit stores on October 8th and, so far, some people actually do like it! Yes, sadly, it's true. I just got word that the Helm #3 will not hit stores tomorrow (as widely reported on various Websites) but will actually hit stores on Wednesday, October 8th, 2008. The Helm #2 is a top ten bestseller for Dark Horse Comics!! The third issue of the Helm has been delayed and is expected to hit stores on October 1st rather than September 17th as originally planned. Sorry about that. And that pleases me no end. You can read his thoughts about the Helm at Unca Harlan's Art Deco Dining Pavilion and you can read his essays, short stories, novels and novellas in pretty much any bookstore anywhere. I particularly recommend his short story, "I Have No Mouth, and I Must Scream," which I first read when I was thirteen and which moves me as much today as it did then. Please rush out and buy a copy!! Or, twelve!! The Helm #1 is a top ten bestseller for Dark Horse Comics!! Dante Maddox at Crave Online interviews Jim about the Helm. Jennifer M. Contino at ComicCon.com interviews Jim about the Helm. Atomic Comics interviews Jim about the Helm. The Quarter Bin interviews Jim about the Helm. Arnie Bermudez of the Tucson Citizen interviews Jim about the Helm. Jazma Online interviews Jim about the Helm. Heavy Ink interviews Jim about the Helm. 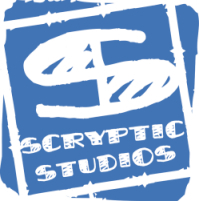 Scryptic Studios' Caleb Monroe interviews Jim about the Helm and writing. The Portland Tribune's Peter Korn interviews Jim about the Helm and how it figures into his role as Creative Director for Character LLC. MY OWN WORST ENEMY: HARDISON TALKS "THE HELM"
Emmett Furey interviews Jim about the Helm in this article on the Comic Book Resources website. Graham Crackers has nice things to say about The Helm and a six page preview of issue #1. Timothy Young interviews Jim about The Helm and about Jim's company, Character, in this podcast on Global Comics.